"The Program can't start because MSVCR100.dll is missing." Help! It doesn’t matter whether you just installed a new program, or if you have been using it for years — getting a MSVCR100.dll error can be extremely frustrating. There is little information to go on, so fixing the problem may seem impossible. Fortunately the answer is very simple, and in just a few minutes you can be up and running again. The short version is, you are getting this error because MSVCR100.dll is missing or damaged. That really isn’t very helpful, though. This file is actually an integral part of a piece of software called Microsoft Visual C++ 2010 Redistributable Package, and that is what is missing or damaged. While that may not clear things up at all for you, it is a step in the right direction. There are many functions that almost all software uses. For the sake of argument, lets say that instead of cryptic DLL files, we are talking about hammers, screwdrivers, saws and wrenches. Simple tools that are used over and over again to perform basic functions. What this software does is to create a little workshop inside your computer that has all these tools in it, easily available to all the other software living in your computer. That keeps your computer cleaner and more efficient, since every piece of software does not have to come with these basic items in their toolkit. In this case, your hammer is broken or missing. It doesn’t really matter too much why it is gone, just that the software you are trying to run needs it, and can’t get it. While you are going to need a brand new copy of your workshop, Microsoft has it available for download free of charge, so there is nothing to worry about. Don’t let this error message ruin your day. The first step to fixing this problem is to see if you are running a 64-bit copy of Windows or 32-bit. For Windows XP, go to your Start menu and click Run. Type winver and press Enter. In Windows 7 and Vista, go to your Start Menu and type Computer into the search box. Right click it and click Properties. The needed information is under Windows Edition. Windows 8 instructions are the same as those for 7, but you will be in the Start Screen rather than in the smaller menu. Download the correct version of Microsoft Visual C++ 2010 Redistributable Package directly from Microsoft. Since this software is free from Microsoft, there is no reason to risk getting the download from a third party. 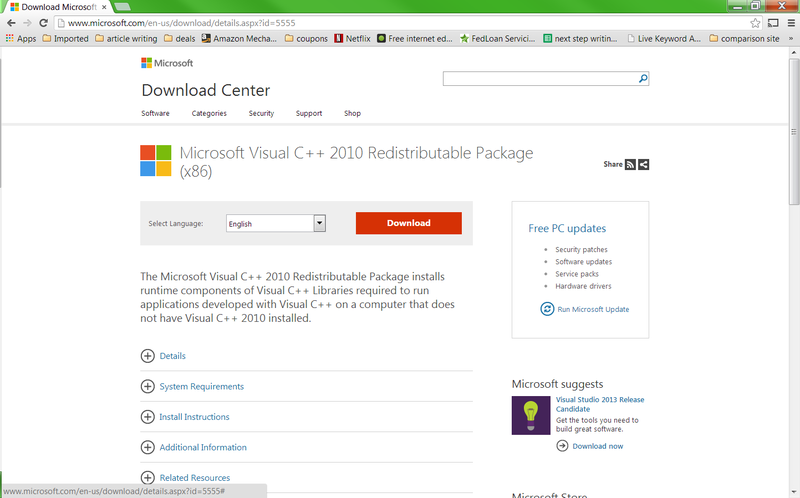 Go to microsoft.com and search for Microsoft Visual C++ 2010 Redistributable Package. You will be brought to the list of downloadable versions. You can sort by release date or just look for SP1 (Service Pack 1) to get the most recent version. If you have a 32-bit copy of Windows, choose the x86 version. If you are running 64-bit, choose x64. The Visual C++ Package download page should look something like this. Download and install the software. Follow the prompts to add this toolbox to your system. Restart you computer, if you have not done so already, and try your software again. Your error message should be gone. While it is unfortunate that MSVCR100.dll error messages do not give more information up front, the solution is very simple. Follow these instructions to get your computer functioning properly again. This software does not update often, so once you are done you should not run into this problem for a very long time.